Trader Joe’s Toasted Pumpkin Seed Oil sounds interesting, looks off-putting and costs $9.99 a can. Maybe you’re intrigued by it – but can you really justify such a purchase? If you write a blog where that’s your only function you can! Let me save you some time, and ten bucks, right now. This oil is not worth your hard earned cash, but before I start maligning it, let’s talk about what Toasted Pumpkin Seed Oil is in the first place. Toasted pumpkin seed oil owes its entire, modern day existence to the region Styria in south east Austria. Styria is probably most famous for being the home of 2004’s Nobel Prize in Literature winner Elfriede Jelinek. If for some reason you’re unfamiliar with Jelinek’s musical use of voices and counter voices in such important works as The Piano Teacher, then I should probably mention that Sytria is also the birthplace of Arnold Schwarzenegger. 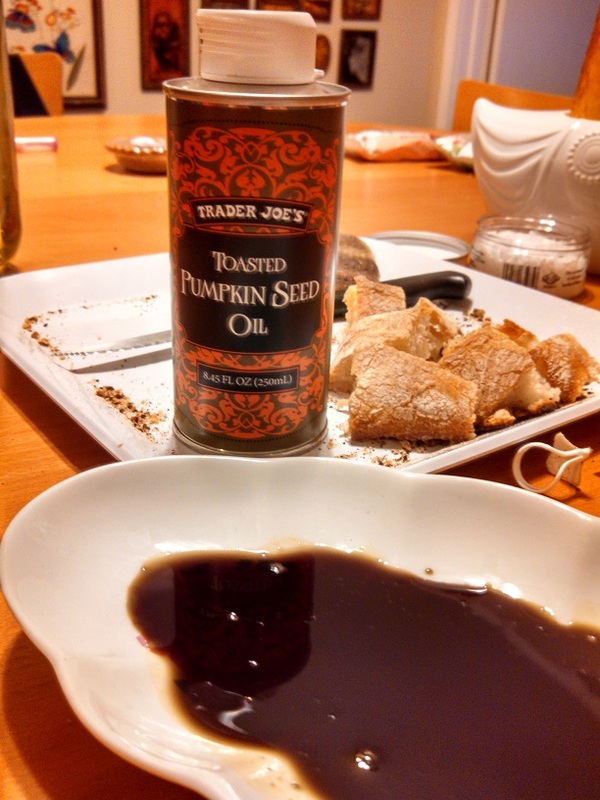 At any rate, toasted pumpkin seed oil is, as Trader Joe’s puts it, “a distinct culinary specialty in Styria”. The fact of that matter is, that’s a gross understatement. The pumpkin as we know it is a New World crop – with no existence in Europe until Chrisopher Columbus brought some back with him from his exotic expeditions. The famous orange gourd spread to Austria where, in the 1600’s, someone got the bright idea to roast the pumpkin seeds then, instead of eating them like a barbaric ape, run them through a press and collect the intensely dark green/brown oil that dribbled out. It was an instant hit. Given all that, plus the high price tag, plus the strange and enigmatic can, you’re bound to assume this is some dynamite stuff, right? Unfortunately, as much as I wanted to love this obscure oil, I was totally nonplussed by it. The big selling point of the pumpkin seed oil is its “intense nutty flavor”. And it certainly is true that the oil has a strong nutty taste – but it also tastes an awful lot like slightly burnt pumpkin seeds. Stronger, and longer lingering, than the nutty taste is this slightly charred taste, and of course the very pumpkin-y flavor of the pepitas. On paper that still sounds like it should be reasonably good, but in reality it was very flat, and somewhat bland. Feeling certain that I must be wrong, I conducted an informal tasting panel with the oil and some of Trader Joe’s fine artisanal bread. All four voices found the same as myself – the oil is okay, but there’s nothing particularly winning about it. As one taste tester put it – it’s fine, I’d eat it if I had it in front of me, but I’d never request it. When you’re trying to sell 250ml of oil for ten bucks, that’s quite the damning review. I’ll wrap this up on two final thoughts. The first, and most perplexing, is why Trader Joe’s didn’t wait until their annual Pumpkin Madness in October to trot out this product. It really doesn’t seem to have enough value to stand on it’s own, but it would have looked wonderful next to the pumpkin cider and pumpkin trees. Second, my favorite thing about the oil was it’s color. The TJ’s product copy calls it “eerily dark green”, and while that’s about right it’d actually be more accurate to say it’s “eerily dichromatic”. When you pour this oil onto a white plate, it’s a thick blackish red, almost like a balsamic vinegar. When spread out thin, however, it becomes an intense spring green. That may not be enough to win me over, but it is pretty cool. Really, the main issue here is that Trader Joe’s Toasted Pumpkin Seed Oil doesn’t exist in a vacuum. As far as bread dips and salad dressings go, it’s alright but I’d go for some nice olive oil of this stuff every time. At least I can cook with the olive oil. If it wanted a little extra nuttiness I’d pick up some dukkah as well. Like the Himalyan Salt with Truffles before it, Trader Joe’s Toasted Pumpkin Seed Oil might make a good gift for your gourmand buddy, but that’s about it. It’s not that the oil is without value, it’s just not worth the price of admission. Would I Recommend It: Not unless they drop the price. Would I Buy It Again: No, I already have more than I need. Final Synopsis: A nutty specialty oil that costs more than it’s worth. Trader Joes pumpkin oil is good quality at a decent price. I must register a contrary opinion. I have found that a *small amount* of TJ’s toasted pumpkin seed oil is transformative to salad dressings, and consequently salads. I think it’s absolutely delicious, even in small quantities. This oil is used all the time in Austria and German as a salad dressing. Trader Joe’s should have spent a bit more time introducing people to it. The best versions come from Styria but there are many producers other than this canned version. $10 is an ok price for it since it often runs as high as $19 in import shops. It is not a cooking oil, and it is often served with a Field Salad (Valerianella locusta) which has sides of kidney beans and red beet slices (pickled or fresh). I find that it is great for mixing with greens like spinach or wilted Kale together with a little olive oil, salt, and pepper. I use this mix to top things like Chicken salad sandwiches. I like this oil best drizzled into a butternut squash or pumpkin soup, preferably with some candied pepitas and sour cream. It doesn’t blow me away in salads, but the Austrians love it there. Totally agree with you – delicious! Using this oil for the first time I found it to be quite pleasing drizzled lightly over their multigrain pita crackers. . My favorite little snack now. Bought some in Ljublijana Slovenia after having it on ice cream. Totally addicting and everyone I’ve served it to has loved it. Try some and form your own opinion rather than take this blog word for it.